One of my areas of interest is the way artifacts, ruins, and fossils are re-interpreted and reused to create and support myths and legends. 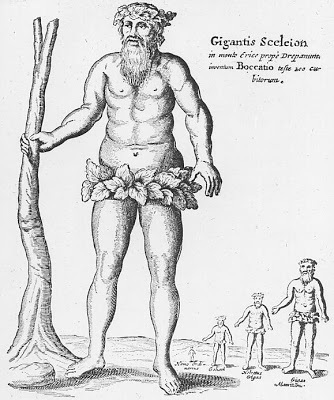 One of the most frequently referenced occurrences of a fossil being taken for a mythic figure is the discovery in 1342 of the skeleton of a "giant" at Drepana, modern Tripani, in Sicily. (The date is given by Thomas Fazellus in his 1558 History of Sicily.) The locals turned to Greco-Roman myth to explain the find, which Georges Cuvier and Othenio Abel both concluded must have been the bones of an extinct species of elephant. Our surviving account of find comes form GIOVANNI BOCCACCIO, the Italian humanist author, in his monumental handbook of mythology, Genealogia deorum gentilium (The Genealogy of the Gods of the Gentiles), composed a few decades later, at which time the discovery had already been encrusted in exaggeration and legend. (Alternately, we might say that Cuvier and Abel were selectively omitting details that do not support their views, such as the lead staff and gigantic chair.) I pick up the translation in chapter 68 of Book IV, just after Boccaccio has described Greco-Roman myths of the Giants. ... Many things must be said if we wish to solve the riddle of these fictions, but before anything, we must say that it is not entirely a fiction that there existed Giants, that is, creatures with the form of men but exceeding them greatly in stature. And indeed, it appears this was the truth, and in these days a fortuitous event in the town of Drepana (Tripani) in Sicily clearly shows this: For, in the foothills of the mountain that rises above Drepana, not far from the town, a few peasants digging the foundation for the construction of a rural house came upon the entrance to a certain cavern. When the diggers, with lit torches, entered in eagerness to see what lay within, they found a grotto of the greatest height and breadth. Continuing into the grotto, they saw opposite the entrance a seated man of immense magnitude, of whom they were much frightened. They quickly took flight and left the cave; nor did they cease their running until they reached the town, announcing to those they met what they had seen. But the citizens were in wonder, and they wished to see what this evil was, so after lighting torches and gathering arms, they left the city together as if against an enemy; and more than three hundred entered into the grotto, and no less dumbstruck, they saw what the workers had reported. At last, they came closer, after they determined that the man was not alive, and they saw him sitting on a seat, resting with his left hand on a staff of such height and thickness that it exceeded the mast of a great ship. So, too, was he a man of a size unseen and unheard of, and neither were any of his parts gnawed at or mutilated. And when one of them stretched out his hand and touched the upright staff, the staff immediately collapsed into ashes, but there remained, as if stripped of its clothing, another staff of lead rising toward the hand of him holding it. Examining the staff to their satisfaction, they determined the lead had been poured into the staff in order to increase its weight, with respect to which, after they had weighed it, those who saw it said it weighed fifteen of Drepana’s hundredweights, of which one of these weights is equal to a hundred common pounds. The body of the man also fell apart upon being touched, and it turned almost completely to dust. When this dust was handled with some of their hands, three teeth of monstrous size were discovered still intact, with a weight of three rotuli, that is one hundred common ounces. To preserve evidence of the giant they had found and to create an everlasting memory for future generations, the Drepanites bound up the remains in an iron net and hung them in a church within the city dedicated to the Annunciation of the Virgin and known by that name. And moreover, a part of the front of the skull was found still solid and capable of holding several bushels of corn. So, too, was found one of the leg bones, of which the fullness of age had caused to reach a state of absolute rottenness; however, those who can determine the total height of a man from the size of even the smallest of his bones calculated from this remnant that his size was two hundred cubits or more. And a pine cut down by his own hand guides and steadies his footsteps. Now at full height, while the towering waves failed to wet his tall sides. And he says many other things that go to show the magnitude of the Cyclopes, suggesting they belong more toward the truth rather than the hyperbole which many decide to use in this matter. Translation copyright © 2012 Jason Colavito. All rights reserved.